And so we've arrived … the first burger post! If you take burgers as seriously as I do, this is kind of a big deal. What can one say about the burger? They are beloved in America and perhaps one of the few foods we can rightfully claim as our own. They aren't the fanciest of foods but they are inarguably some of the most satisfying. Their ingredients are humble - meat, cheese, bread - but somehow together these modest components equate to a kind of culinary magic. Biting into a good burger is quite literally food for the soul. An overstatement? I don't think so. When burgers are done well, they're something to marvel at! Not only that, everyone - and I mean everyone - has an opinion as to what constitutes a good burger. I once had a heated fight with a dear friend over whether or not raw onions belong on a burger. I steadfastly declared NO! He vehemently exclaimed YES! "A burger needs bite!" he bellowed. "But not by way of an astringent raw onion!" I shot back. "Your taste must be dulled" I scoffed. "Better dulled than precious" he mocked. The fight ended with a late night burger cooking showdown … raw vs caramelized onions. What can I say, we were passionate about our burgers. And we'd had whiskey. But it made me realize that when it comes to burgers, enthusiasts differ greatly in their opinions. And, personal opinions aside, who's to say who's right? If you like your burger piled high with chili, french fries, peanut butter (*gag), etc well, more power to you. I, however, am usually more of a burger "purist." A nice bun, crisp lettuce, a slice of ripe tomato, decent mayonnaise and EXCELLENT meat (cooked correctly and with care) is all that I require. Oh, and good cheese. Preferably a mild cheddar. I need that too. And bacon … thick cut, well smoked bacon! Still, pretty basic. - Don't overcook a burger. It leaches moisture from the fat which kills the flavor. - Don't use a cheese that is too aged. It may be tempting - aged cheese is awesome - but aged cheese typically won't melt in a way you'd want cheese to be melted on a burger. - Don't use cheese that is too sharp. It's acidic and it will detract or alter the flavor of the meat. - Don't use binders. No eggs, milk, breadcrumbs, etc. You're making a burger, not a meatloaf. Onions belong on top of the burger, not mixed in. Same for garlic. This rule also applies when it comes to "stuffing" a burger. Do not. It throws off the balance of the sandwich's construction (i.e. too much concentrated, complex flavor in one spot) and it's unnecessarily indulgent if you are using good meat. Most importantly, however, it's just not a real hamburger anymore. - Don't cut into a burger straight from the pan or grill. Give it a second to rest and allow the juices to reabsorb back into the protein. - Do use the best meat possible. Spend the extra money on meat from a butcher or other reputable source. It's not a huge price jump and it is so important. Cows raised and butchered the right way taste indisputably better than cows raised and butchered the wrong way. Period. Remember, the starring attraction of a burger is the meat so why would one ever scrimp on this part? - Do use meat that has NEVER been frozen. Ice molecules that form in the freezing process actually dilute the meat's flavor when they dissolve. No bueno. - Do use a 80/20 meat to fat ratio. If you're using bison or grass fed chuck, you'll need to supplement with a fattier cut like brisket. - Do use a good, thick cut smoked bacon. The thick cut holds up to the density of the meat patty while the smokiness deepens the flavor of the beef (and while we're on the subject of bacon, do save the rendered fat from the bacon to sear the burger in. You'll thank me later). - Do use high quality buns. Plain, white, grocery store buns are gross. Choose a buttery brioche or sweet potato bun instead. - Do use fresh vegetables that are chilled, straight from the refrigerator. The cold, crispness of those vegetables is the only component a burger has to balance the all the rich heaviness of the meat, cheese and bread. - Do learn how to make homemade mayonnaise and do use that in favor of the store bought variety. - DO pair with an excellent beer like Anchor Brewing's Anchor Steam Beer. It's a safe bet most are familiar with this exceptional lager. Anchor Brewing Company is THE pioneer craft brewery of the United States and began brewing their legendary beer in 1896. Known as a California common or "steam beer" Anchor Steam is thought to have gotten it's name from the practice of fermenting the beer on the rooftops of San Francisco whose cold climate caused the warm beer to steam up into the atmosphere. They have stayed true to their original brewing process and their name is synonymous with quality, tradition and integrity. Anchor Steam Beer, renowned and respected is a fine example of their commitment and it is a classic burger beer! In a hot pan, cook the bacon to your liking, reserving the fat for searing the burger. For the burger, choose a large cast iron or commercial grade sauté pan that will retain heat well and evenly. Season the ground beef patty on the exterior sides (*note this is the only seasoning required. A good coating on the outside eliminates the need for any additional seasoning to be mixed into the patty). Heat the sauté pan on high for 5 minutes. Drizzle a few drops of water on the pan - once the pan is hot enough, the droplets will scurry around rapidly and evaporate. Once it is hot enough, move the pan off the flame and add the bacon fat slowly (this is important as adding the fat while on the flame can ignite a grease fire). 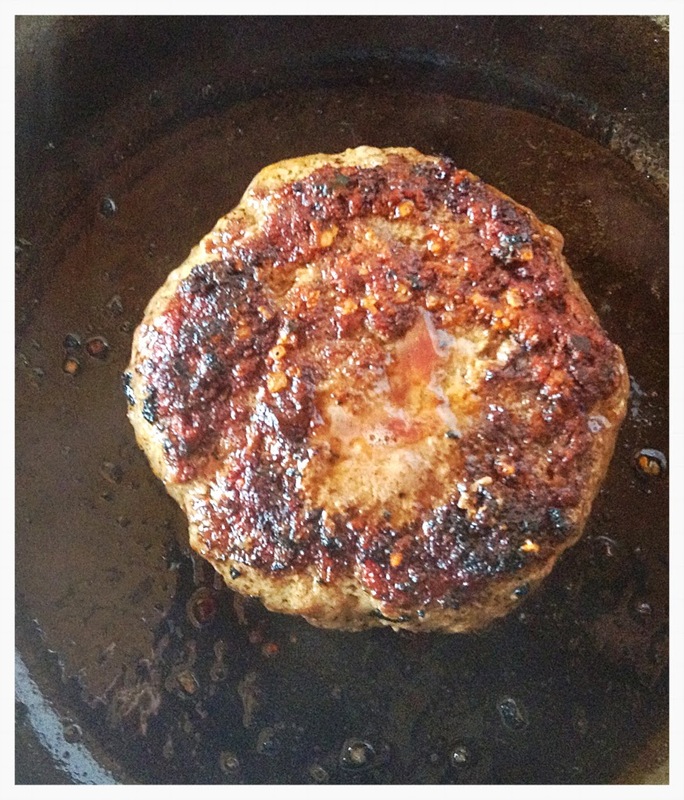 Bring the pan back to the flame and sear the patty for 3 ½ minutes per side. It is very important to keep constant heat so adjust the temperature on the flame as needed. Don't be timid. Let the burger sear for the full 3 ½ minutes per side. Set a timer if necessary. Let rest for 1 minute. Turn on the broiler to high. Toast the bun for 1 minute per side. Place the burger back in the pan and top with cheese. Set it under the broiler for 1 minute. Spread the bun with mayonnaise, top with burger, then tomato, then lettuce. Vegetables on top mean they stay crisp and crunchy! As mentioned above, this is one of my favorite beers to pair with burgers. The mild malt build of the 2 row barley combined with a touch of the specialty caramel malts give a subtle but sophisticated sweetness. Meanwhile, the cluster hops are forward enough to balance the malts and leave a clean crisp finish. The traditional lagering techniques that have been used for over a century adds a mineralic flavor that is second to none. This pairing is a good bridging in which. The caramel malts highlight the caramelization that occurs in the searing process of the burger, while the smokey bacon counters the creamy sweetness. The hops are mellow but add just enough balance to cleanse the palate and refresh the mouth. The yeast adds a bright crisp mineralic finish that also helps to cleanse the palate but more importantly, heightens the beef flavor and body by brightening it's rich umami.